Major steam generator design changes by Southern California Edison (SCE) are the likely cause of radiation leaks and unusual accelerated tube wear in the San Onofre nuclear power plant’s four steam generators, states a new study by nuclear expert Arnie Gundersen. San Onofre has been shut down since January after plant operators discovered radiation leaking into the air. The leak was caused by a tube rupture in one of the new Unit 3 steam generators. Reactor Unit 2 has been offline since January 9th. Unit 3 has been offline since January 31st, less than one year after it was installed. Both units have premature steam generator tube wear. The redesign crammed almost 400 additional tubes into each of the generators. These additional tubes required additional holes be drilled in the “tubesheet,” the critical radiation barrier that serves as an enormous foundation supporting the entire generator. Making room for these additional tubes required the removal of the critical supporting “stay cylinder”. This support pillar was designed to secure the generator and prevent vibration – exactly the kind of vibration that seems to be behind the tube degradation. All of these changes necessitated pressure and flow changes in the generator’s operation. This Fairewinds Associates study, San Onofre Cascading Steam Generator Failures Created by Edison, is the second in a series commissioned by nuclear watchdog Friends of the Earth. “Southern California Edison continues to try to downplay the issue, even as they finally admit the truth – there is no difference between reactors 2 and 3 and they have the same problems” said Shaun Burnie nuclear specialist to Friends of the Earth. “This whole crisis arose because of substantive changes made in the design and fabrication of key components. The NRC has to date adopted the Edison position that there is a difference between reactors 2 and 3. That was always wrong and irresponsible and now we have confirmation from Edison about what our analysis has been saying for weeks. Here’s a tip: when your nuclear reactor is springing leaks and radioactive pipes are deteriorating twenty times faster than they should, it’s a big deal, and no amount of nuclear spin by Edison or the NRC can hide that fact,” said Burnie. The report notes that these dramatic changes were all portrayed to the Nuclear Regulatory Commission as an exact replacement of the original steam generators. The original generators lasted over 20 years, while the new ones were falling apart within less than 20 months. The report also found no difference between Units 2 and 3. “In Fairewinds’ opinion, the vibration between the tubes caused the steam generator leaks and degradation… and was due to the simultaneous implementation of numerous unreviewed fabrication and design changes to the replacement steam generators by Edison/MHI. The NRC can no longer justify its position of treating the problems at the reactors as separate. A root cause analysis of both reactors – not just unit 3 was always necessary – now Edison have provided the evidence as to why,” author of the report Arnie Gundersen stated. Gundersen is a 40-year veteran of the nuclear power industry. A former nuclear industry senior vice president, he earned his Bachelor and Master Degrees in nuclear engineering, holds a nuclear safety patent, and was a licensed reactor operator. During his nuclear industry career, Gundersen managed and coordinated projects at 70-nuclear power plants around the country. Friends of the Earth and local citizen’s groups released a new video ad campaign last week targeting Southern California Edison. The ad calls on citizens to let the utility know that their families come first – and that they must not restart the troubled San Onofre nuclear reactors currently facing serious questions about safety and secrecy. The citizen’s groups include Citizens Oversight Projects, Committee to Bridge the Gap, Physicians for Social Responsibility – Los Angeles, Residents Organized for a Safe Environment (ROSE), San Clemente Green, SanOnofreSafety.org, and the Peace Resource Center of San Diego. This entry was posted in California ISO, Energy Options, Friends of the Earth, NRC, nuclear power, Radiation Monitoring, SDG&E, Southern California Edison, Steam Generator and tagged Arnie Gundersen, Edison, environment, nuclear plant, nuclear power, nuclear reactor, radiation leak, rolling blackouts, san onofre, science, SDG&E, Southern California, steam generator. Bookmark the permalink. Consider this scenario: A design basis earthquake (DBE) or something an order of magnitude worse causes a rupture in the main steam line (MSLB) upstream of the main steam isolation valve. 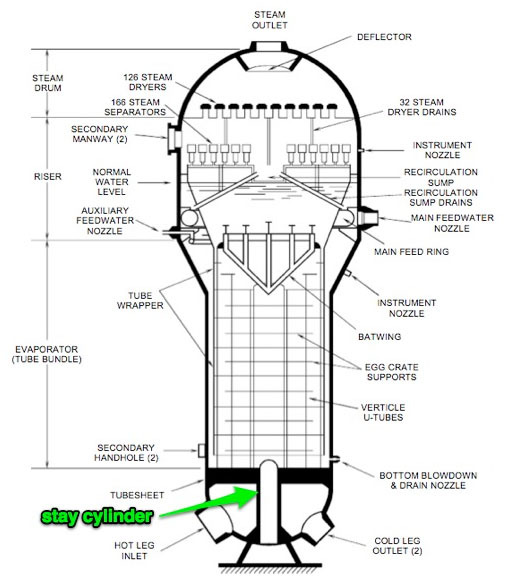 Rapid depressurization of the affected Steam Generator results in multiple tube failures and compromises the Reactor Coolant System integrity. The environmental pressure and temperature in the Containment Building rises rapidly (due to dry steam addition) and challenges or very well exceeds the values predicted for the design basis accident (DBA = LOCA). With very little design margin for the current DBA, it would seem that this should be a legitimate concern.